American Gothic was painted by Grant Wood in 1930. It is one of the most familiar images in 20th-century American art and has been widely parodied in popular culture. A parody is an imitative work of art based on a recognizable image, meant to to be comedic or ironic. 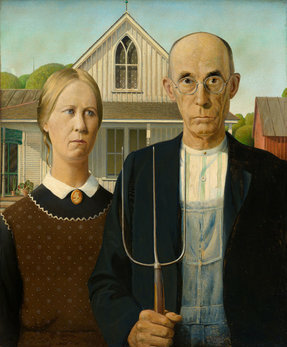 Watch the following video to learn about Grant Wood, why he painted this famous image and see some examples of American Gothic Parodies. For our project, we will be creating our own parody of American Gothic. Yo can choose characters from popular culture, or make up some of your own! (scroll through the student examples to the left) Your composition should be recognizable as a parody of this famous artwork, even though you will be putting in your own elements.